Geoffrey Bishop of Flagstaff, AZ performing a few massage and movement techniques related to sports. Geoffrey has been working in Flagstaff since 1999. Working with athletes of all abilities, corporate America production and desk workers and anyone in between. The focus of massage techniques at Stay Tuned Therapeutics is typically on injury prevention, and if it comes to it, rehabilitation of injury. To book your appointment call 928-699-1999. Pt. 1 The technician grasps the ankle gently, inferior to the medial and lateral malleoli, tib/fib. Applying a gentle squeeze will suffice in creating distraction of the tib/fib away from the talus. Lifting the leg off the table, the clinician gently “whips” the foot to and fro, mobilizing the foot from the leg, via ankle movement. As the foot is thrown away from and drawn near to the clinician, balance of supination/pronation in the calcaneus and talus may be achieved. PT. 2. 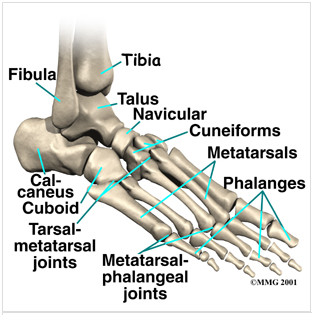 The Tarsal-metatarsal joint is the target of this hands on mobilization technique. The technician drapes their up body hand around the arch of the foot, isolating down on the cuboid and cuneiforms. The down body hand grasps each distal head of the metatarsals 1-5. While holding steady the arch against the technician’s body with up body hand, the down body hand rocks, rotates and distracts each tarsal-metatarsal joint, restoring movement in this very important, first line of defense, spring mechanism. Home retraining from Boddicker Performance.